The love affair between gospel singer Ringtone and socialite Pendo is real, MondayBlues can now reveal. A week after we reported that the two were having a fling after spotting them at a church in Nairobi and later in Naivasha, we can confirm that they spent the entire week together at Ringtone’s Karen residence before coming out on Saturday to give back to the society. MondayBlues also has exclusive details of Pendo and Ringtone going out shopping at a high-end Karen mall on Wednesday. They also did some property window shopping in Runda on Thursday morning, with Pendo driving Ringtone’s Range Rover. The weekend before last, the two accepted photo requests from fans and at some point even signed autographs, all the while mingling freely with worshipers at the Deliverance Church in Kasarani. Last Saturday, the pair spent the entire day giving clothes and food to Korongocho residents in a new joint project Pendo said was christened Uji Mtaani. “We are bonding well. Ringtone is really a nice guy. That is all I can say for now,” Pendo told MondayBlues yesterday. “We are cool... pretty cool. We are moving towards February, which is the romance month. Probably, just probably, there will be a word on us from one of us,” she added. 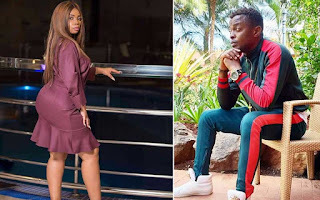 This could be one of the most unlikely romantic affairs in the local showbiz scene coming only a month after Pendo and her white boyfriend called it quits. Pendo and the man had dated for about five months during which time he proposed to her. “We just attended church and I am not sure what people are reading in this. Church is a good place to be, a good place for all, a good place for developing friends too. Besides, where else would you have wanted to spot us,” Ringtone, who recently announced he was interested in priesthood, said. “Let’s just say Pendo and I are doing something we both feel right about. Our consciences are clear. We are on a good go,” Ringtone added.